as the one in your hand – the very first volume of newsletter, in which compilation of freshmen’s and RST’s writings are included. After every volume of newsletter has been published, we find it a pleasure to hear the voice of freshmen who are new to keep peace and also learn how to build peace revealing their thoughts and feelings, reporting the event of volunteer and peace celabrated and held around us and sharing helpful study and life skills experienced by participants themselves. Hopefully, you can find something useful herein, and may find a little of yourself and your memories of Mekong Peace Journey I. Many important events, tasks and missions are coming. 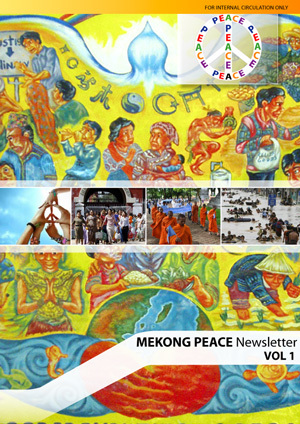 This volume is published as wish for all were, are-being peace-builder in Mekong region strong determination to continue growing and enjoying peace-builder’s life. - trusting that things will turn out all right. Peacefulness is also a way of approaching conflict with others so no one is made wrong.